Autism Society Philippines (ASP) expands its network of partners as it successfully conducted seminars in the City of Dasmariñas and the Municipality of Alfonso, both situated in the province of Cavite. The seminar series were conducted as part of ASP’s ongoing project, titled “Educating Children with Disabilities of their Rights Using the Digital Talking Books,” funded by AusAID. The first seminar was held on 7 November 2012 at the DASCA Building in Dasmariñas, with ASP Dasmariñas Chapter and the Center for Special Needs as host, while the second seminar was held on 14 November 2012 at the Municipal Hall in Alfonso, hosted by the newly-incepted ASP Alfonso Chapter with the support of the Municipality of Alfonso, Cavite. 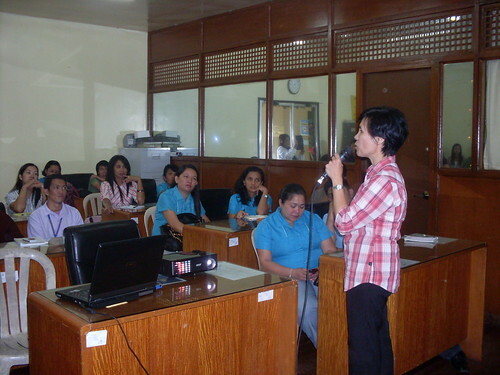 In both seminars, Executive Director Ranil Sorongon discussed the UN Conventions on the Rights of the Child (UN CRC) to both the teachers and the parents of children with disabilities, while Project Officer, Cathy Genovia demonstrated how to navigate DAISY Digital Talking Books, as well as how to use AMIS, the reader for said talking books. In addition to said topics, Mr. Sorongon discussed to the parents and answered their issues of the rights of their children in the local setting, particularly the provisions of Republic Act 9442, among which is the entitlement of special discounts on commodities such as hospitality establishments, amusement facilities, food items, medications, transportation, and medical services. Through this project, ASP is continually expanding its network of partners in educating persons with autism and other disabilities on their rights and responsibilities. For information on how to become a partner, please contact the ASP National Office at (02) 929-8447 or e-mail at autismphils@gmail.com. This article was contributed by Gerard Joseph Atienza, Secretary, ASP Bacoor Chapter.